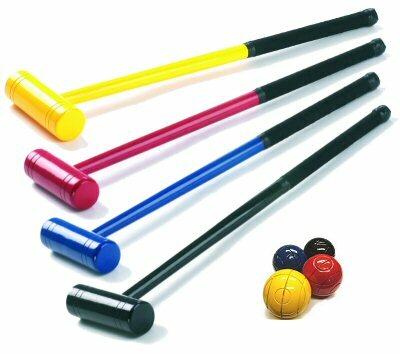 Smaller-size Croquet Mallets & Balls - Ideal if the youngsters want to play, either with you, or amongst themselves! Many good family croquet sets are supplied with full-sized croquet mallets and balls, which are perfect for adults and teenagers. However, often there will be younger children who will also want to play along too, and they will find it much easier to play with a croquet mallet and ball more suited to their size. Our junior mallets are perfect for children up to 7-8 years old. Lightweight, yet strong these colourful mallet & ball sets are perfect for encouraging children to take up the family croquet tradition from a young age.